Finished up the new pieces of scatter terrain I started last week. Mostly, I’ve spent a lot of time the last four days or so waiting for glue to dry! Do one stage of greenery, wait for glue, next bit of greenery, wait for glue, add second coat of glue to really secure everything, wait for glue… You get the idea! First layer of greenery, my usual mix of flock and ground foam, with coarse ground foam bushes. Click for larger. For a better idea of the heights of the tree trunks. Click for larger. 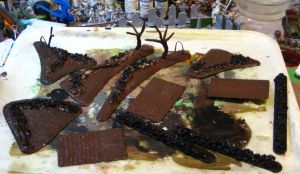 The bushes are coarse ground foam from Woodland Scenics, soaked in dilute white glue and pressed gently into place, then set aside for at least 24 hours to dry. They’re solid enough once dry you can lift the smaller pieces of terrain by them, although I don’t recommend doing this regularly! Lichen added to the trees, caveman for scale. Click for larger. The lichen got hot-glued into place, and I was finally able to declare these terrain pieces done! All the pieces – three 6″ rock wall pieces, three 3″x2″ fields/gardens, five random-shaped scatter pieces. Copplestone 28mm caveman for scale. Click for larger. Lower angle to show the heights of the trees. The lefthand tree is about 4.5″ tall, the shorter two are about 3.5″ tall. This is not a new project, just something I remembered while waiting for glue to dry on my current scenery and decided to revisit. In September of 2009 I sat down with a bit of Milliput and some scrap wood and created the following lectern, upon which resides a Tome of Madness, filled with eldritch verses of great power and bound in the red leathery hide of captured demons. Or something like that, anyway. It was a birthday gift for my brother as he was busy painting a group of cultist figures from Pulp Figures. That pre-dates the current version of this website, so it never got featured here, although I did show it off over on the Lead Adventure Forum. Enjoy! Having done hedgerows and fields, I wanted some rougher, more overgrown terrain, and I also wanted to start experimenting with tree creation, as trees are the one thing I’ve been lacking in my scenery so far. 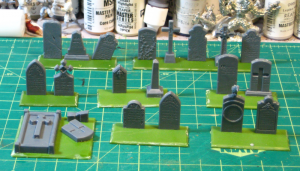 I started with the last reasonable-sized offcuts of the 3mm plastic I used as the base for the fields. The rock walls are decorator’s gravel and Gorilla Glue. I mentioned Gorilla Glue briefly in the article on fields, but briefly it’s a thick glue (the colour and consistency of honey) that activates with water, and expands as it dries, foaming outward. I wet the surface of the plastic card with a damp paintbrush, ran a bead of Gorilla Glue were I wanted the wall, dumped gravel in roughly the formation I wanted, then sprayed the whole thing liberally with plain water. The expanding Gorilla Glue will fill some of the gaps between the pieces of gravel, and also fill out the bulk of the wall slightly. After it dries (a couple of hours) you can always run a second bead of glue across the top of the wall and dump more gravel on. Two layers of gravel like this will get a wall up to just over waist high on a 28mm figure, which is enough for my purposes. The three straight rock walls are based on tongue depressors, so 6″ long and about 3/4″ wide. The three small fields/garden bits are old credit card sized gift cards I had lying around, with the raised beds and plow furrows done with hot glue. The larger pieces are all from the 3mm plastic card offcuts, the longest being about 8″ long, the triangular piece about 4-5″ a side. Gravel and Gorilla Glue for rock walls. Click for larger. The trees are fairly heavy wire (sold in local hardware stores as “utility wire”, I seem to recall) bent and folded with pliers, then glued down with hot glue. Once they’re secured, I used more hot glue to bulk out the trunk and major branches. 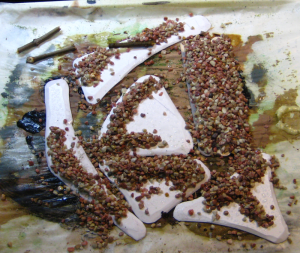 Everything – ground and trees – got slathered in white glue and had sand dumped over it at this point. Rock walls done, on to tree trunks, then sand over everything. Click for larger. 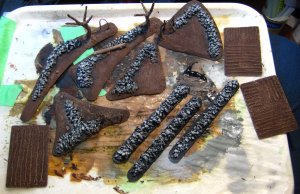 After the sand had dried overnight, everything was basecoated with dark brown paint, mixed randomly with a bit of black paint. The rock walls got straight black as a basecoat. 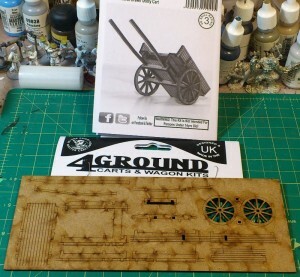 All my basecoats also have a healthy dose of white glue mixed right on each piece to secure the sand and gravel. Basecoat – brown over everything but the rocks, which get black. Click for larger. Last bit of painting is a pale brown/tan drybrush over the dirt and trees, dark grey then pale grey/white over the rocks, and finally a pale grey/tan/white mix drybrushed on the tree trunks so they’re a slightly different colour from the ground. Drybrushing done – light brown & tan on the dirt parts, dark grey & pale grey (almost white) on the rocks, final grey/tan drybrush of the tree trunks. In Part Two, flocking, scenic foam and other scatter on the ground, lichen for bushes, shrubs and tree foliage. Coming soon! 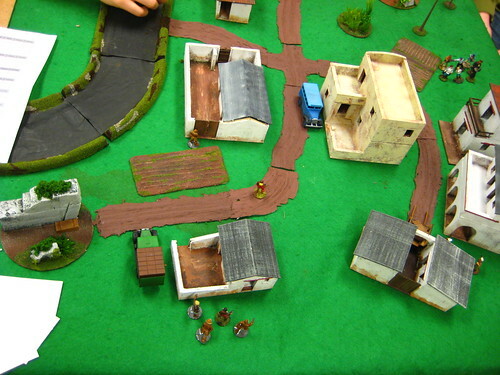 I picked up a copy of the recently published pulp skirmish rules Pulp Alley sometime last month, and we finally got a game of it in today. Pulp Alley is published by the father & daughter team of Dave & Mila Phipps; the $10 45-page PDF has all the basic rules for pulp mayhem, designed around teams (“Leagues” in PA) of about 5-8 Heroes, Sidekicks, Allies and Followers. I’ll likely do a full review of PA soon, but the basic rules are well-written and well-edited, with nice pulpy graphic touches throughout. 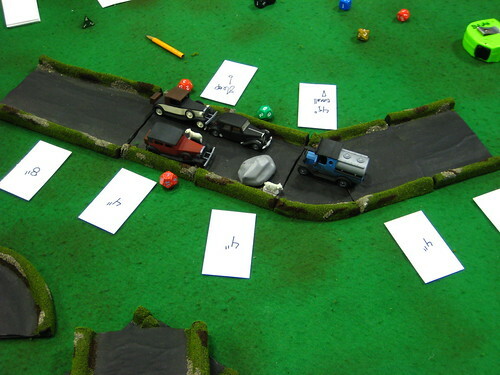 For this game I copied the sample League provided in the book, hacked together a second League quickly, then assembled two more Leagues by getting players to play mix-and-match between the two existing Leagues. This left a lot of rules and features unexplored, but as a quick-and-dirty method of assembling four not-quite-identical teams it worked OK. We got out my underused tropical buildings and a few bits of jungle terrain and got to it. Early in the game. 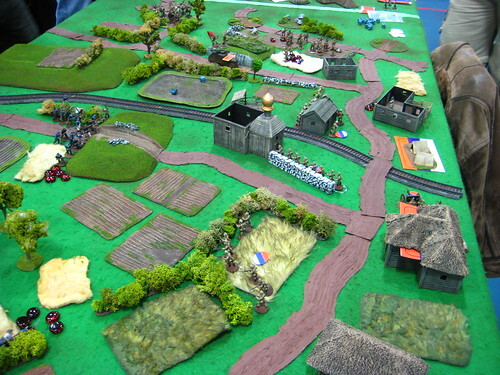 Air Pirates in the foreground, Sailors barely visible bottom-right, Russians in a clump top-right. Cultists are off-camera top-left. Click to view on Flickr. Fairly late in the game. 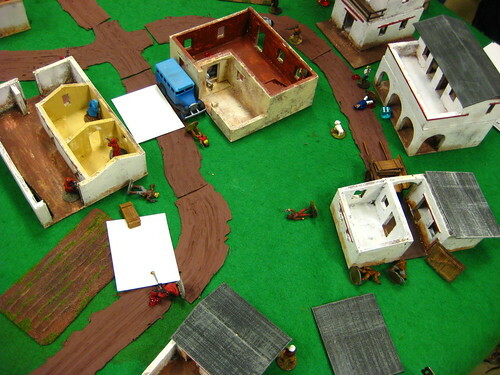 My Air Pirates are mostly down, the Cultists have forted up in the lefthand building, and the Russians and Sailors are brawling in the street to the right. Click to view on Flickr. I’ll be writing up a proper review of Pulp Alley sometime soon, probably in a few weeks after we have another couple of games. The initiative system is different and interesting, with initiative changing hands based on winning fights or capturing objectives. The Fortune Card deck is a great idea and added quite a lot to the game, especially a few turns into the scenario when we were all a bit more comfortable with the rules. The combat system is elegant, although I can tell I need to stop at my FLGS to get a few more d8s before our next game. Before next weeks game I want to properly build several Leagues to get a better idea of the character and League creation rules; there’s also several questions I’ll need to ask over on the Pulp Alley forums, mostly to do with wounding and recovery from wounding, which we got slightly confused by! 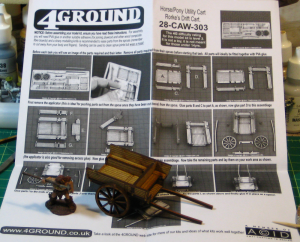 It was great to get back to pulp gaming again, and I’m looking forward to getting more familiar with the Pulp Alley rules. First “Links of Interest” miscellaneous post for 2013, so it’s a long one! 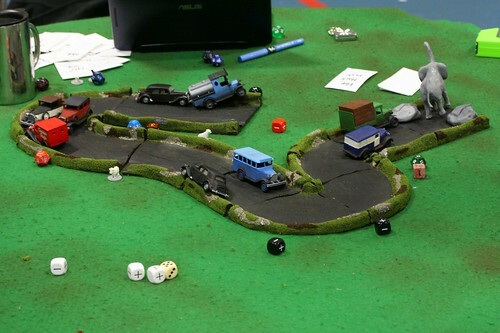 The fantastic blog Wargaming with Silver Whistle is, like I was recently, also making fields. His are spectacular, and might inspire me to re-visit the subject again in the near future! He’s got fields and allotments, large wheatfields, and finally some haystacks, all lavishly illustrated. TutoFig.com is a multilingual European website that aggregates links to all sorts of tutorials – figure painting, sculpting, terrain, and all sorts of other stuff. Lots of high-quality links there, and I’m flattered they linked to my hot-glue fields tutorial, which is how I discovered them in turn. 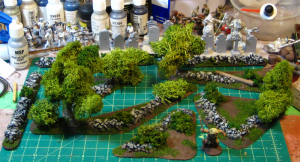 Staying with the scenery theme, The DM’s Craft Youtube channel has lots of short terrain videos, focusing on the quick-and-cheap (but effective!) 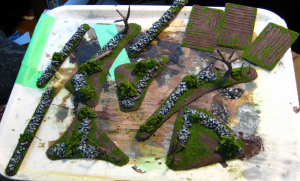 end of terrain making, and especially the many, many uses to which one can put a hot glue gun! Moving on to the Russian Civil War and World War One, the Photo Palace blog, WW1 & RCW Photos Found is a post about an amazing collection of photos by an American who was working with the YMCA in both France and Russia during World War One, and who then escaped the Russian Revolution via Siberia and China – and he took photos the whole way, as well as buying photo postcards and such as he travelled. There’s only a few photos from the collection up online right now, which is unfortunate, but they’re really neat, atmospheric photos! The same blog also has French WW1 Photos Found Still in Camera, but again, too few of the actual photos posted online so far! The US Army’s famous West Point Military Academy has, unsurprisingly, a first-rate History Department, who have put online their Atlas of Military History. There’s no maps of the Russian Civil War, despite American forces being involved both in Northern Russian and Siberia as part of Allied Intervention forces, but there are great clear maps of World War One on the Western Front, as well as maps for nearly every other war the Yanks have been involved in. Looking for information on Russian armoured cars I found PDF archives of the “Armoured Car Journal” from the early/mid 1990s, with several interesting World War One articles, although nothing specifically on the Russian Civil War. Finally, if you’re doing up artwork, cards or other handouts for gaming, another source of nice textures and background images is always useful, so here’s some Free (CC-BY Licensed) textures collected on Flickr – hat tip to Sidney Roundwood for the link.